Of course this update is a day late…. that goes without saying. Everything from the last post is still going strong. I’ve taken my rings off, even though my hands aren’t swollen all the time. I’ve had to pry them off 2-3 times now and I’m terrified that they are going to get stuck. I can tell my feet are starting to swell too. Just a little bit, but the toes turn white when I bend them and they just feel swollen. Just standing in the shower makes my feet ache. I am absolutely ready to be out of this apartment and in to our new house! Even though I’ll still have to walk the dogs for a little bit until our fence is built, it will be nice to not have to bend over to pick up the poo in a little baggy. Ever bend over with 24lbs of belly in front of you? Not easy, or fun, or cute. 2.5 more weeks! I can do it! 9 more weeks at most! Woo! I’m not sure how many of your infertile ladies out there have had this problem, but I thought I’d share my experience. My family doesn’t know about the infertility and the fertility treatments. There are a lot of reasons why, but it boils down to two big ones. 1. My family is insane and would call me constantly telling me things I already know. 2. It would worry them, and they have millions of other things to be worried about. I suppose this means I am both selfish AND concerned. I can live with that. So, not knowing our circumstances, I can excuse my sister for doing THAT game during my baby shower. I think you all know the one. The one where after you’re done opening your gifts someone stands up and repeats back all of the comments you made, saying that these were comments made on the night your baby was conceived. Usually it’s things like “Oh, look how cute and tiny it is!” or “I’ve never seen one so small!” Sure, it’s amusing, but to the closeted infertile, it’s awkward. Made even more awkward by the fact that my friends DO know what I’ve been through. I’ve never heard a room so quiet. I was appreciative of them not finding this amusing. I wasn’t offended, because there was no way she could know, but I do think the game isn’t amusing. Is it because of my struggles? Maybe. I think it has a lot more to do with the fact that this is a party for a baby. Who wants to think about how that baby was made while at a party featuring rubber duckies, onsies, and colorful cupcakes? I understand it being amusing to do during a bridal shower (depending on how many old-fashioned grandmas are hanging out), but not a baby shower. I hope that none of you have had to experience this awkward game during your showers. If you have, I hope your friends and family who know your struggles haven’t giggled and forgotten everything you’ve been through. I shouldn’t even post that these updates are late. It should just be a given. I did take a belly picture this week though, so I’ve got that going for me. So, the pregnancy insomnia is back. It is possibly the meanest of all pregnancy symptoms. You are already exhausted even when you sleep well. Although “well” usually means up every 2 hours to pee or change positions because your back and legs ache so badly. I’m not complaining, mind you, but I am simply stating that you’d think your brain would let you shut down for a couple hours to let you rest from the overall insanity that is having less than nine weeks left. WHOA! The swelling has also started. 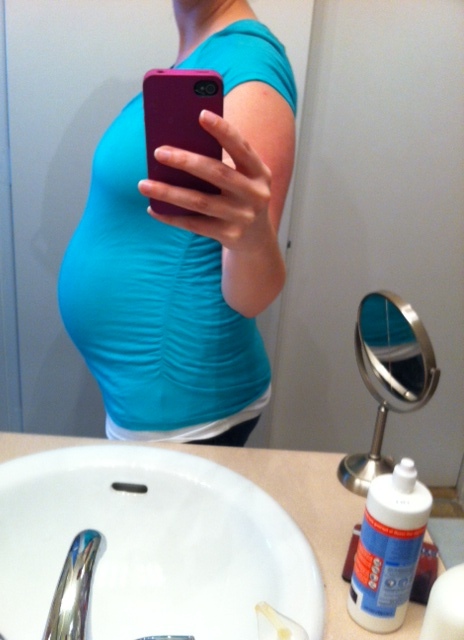 Everything below the belly is swelling. The YOU KNOW area, as well as the new hemorrhoids, and the feet (slightly, if I’ve been on them for a while). I’ve had a hemorrhoid since high school. It comes and goes. I’ve even been to a Proctologist and everything. Now, along with a bit of constipation, it’s getting a bit…. irritated down there. I’ve started back on prunes to at least alleviate the going pain. I have a feeling this problem will only be getting worse though. Here is the belly! My shirt is actually green, but my phone needs to be put out of it’s misery…. All was well! Strong heartbeat from my little one, and I gained exactly the right amount of weight! Woo! First time in months I haven’t been given the “well, maybe you should watch what you eat a little more….” I call that a win! I also went to the chiropractor. I’ve been going once a month to coincide with my OB appointments. I told him about how the only time I don’t have horrendous leg pain at night is when I get an adjustment. I’m good for about 3-4 days and then the pain is back… with a vengeance. The diagnosis? Being put back on active care, meaning that I will go twice a week and insurance will cover part of it. If I can start sleeping better I will be all like.. WOOOO!!! I’ll keep you all updated. I’m actually posting this ON my 30 week turnover! Woo! First time in a few weeks I’ve been on the ball. 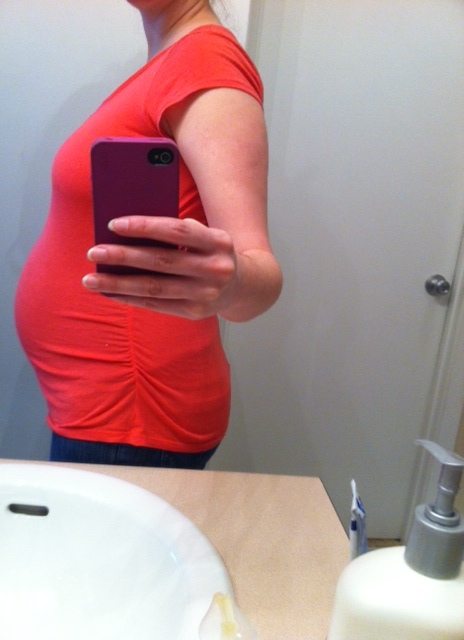 I even have a belly picture this week! We moved into the apartment yesterday. We still have a few things at the house to pick up, but we should be done by tonight. The apartment is a disaster. It was great putting apartment stuff into a house, but vice versa is not so pretty. I’m just hoping we have enough space to hold the in-laws this weekend for baby shower #1. As long as we have a clear path to the bed, we should be fine I think. The nausea over the past week has been less than fun. It kicks in around 3-4PM and lasts until I wake up the next morning. I’m going to be more vigilant on drinking water. I barely had two glasses yesterday. Yes, I know, it’s bad. I’m also starting on prunes. My ‘wake up and HAVE to go’ thing I’ve had the entire rest of the pregnancy is beginning to slack off. I think this might be another reason I’m getting nauseous. I’m still eating, but there isn’t room for the food! Good thing I don’t mind the taste of prunes! The leg pain is out of control. It used to wake me up every 2-3 hours. Now it’s about every hour. Chiropractor is this week though! Woo! That should help for a few days. I also have my 30 week appointment this week. Appointments every two weeks is going to be awesome. I’m so impatient! Here is my belly! Looks pretty normal to me, but maybe it looks bigger to you? Same size? 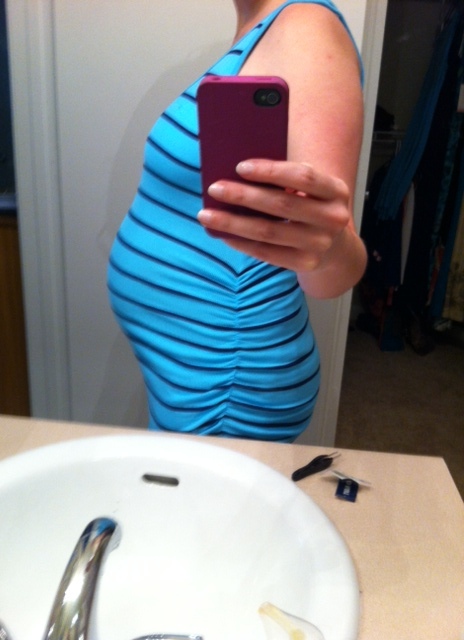 …to be in the third trimester. It hit me hard today. I couldn’t sleep past 8:00 this morning, so I’ve been exhausted from the moment I rolled myself out of bed. I also have a soreness in my side. It feels like my skin is stretched so far that it might tear if I move too suddenly. I don’t think it’s actually my skin, but a muscle under my skin. All normal from what the internets say, but it really does put a damper on doing anything useful when it’s difficult to stand up straight. I’ve also been a bit nauseous today. I had a sandwich with turkey on it, and apparently I’m back to my first trimester hatred of turkey. We had a good run in the second trimester, turkey, but I think you are going to be a husband only lunch meat for the next little while. Also, bending over? Yeesh. I feel like I’m going to pass out or vomit as soon as I tip my head even slightly past my stomach. Is it worth it? Absolutely! I just hope all my nausea inducers from the first trimester don’t come back. What would I do without ice cream for the next 11 weeks?! Ah! 29 weeks this past Monday (4/8)! To say that this week has been busy would be putting it mildly. My family came into town and helped a lot with packing though! That was great to have so much help getting all of the little stupid nic-naks into boxes. We also moved just a few things into the apartment. Ah, apartment living. Not looking forward to that with two pooches to walk, multiple times a day… I guess it will keep me active though. I know I’m supposed to be more tired, but I think being so busy has kept me from passing out every day. My legs still ache when I sleep. Being active during the day, soaking in a hot bath (only my legs), or doing the stretches the chiropractor gave me is just not helping at all. I give up. I will just say that if this is the worst pregnancy thing I have, I am a lucky girl. On the house thing…. we got an offer accepted today! If all goes to plan, we will move in at the end of May. This gives us a month to get acclimated to a new city. Ah! I could switch OB’s once we get out there (with four weeks left in the pregnancy) and go to the newest birthing center in our area, or I can stick with what I know. We will be 25 minutes from our current doctor/hospital if I don’t switch. It seems like a long time, but my family lives in the country and they all made it to the hospital for their births. Although, looking at the newer one makes me really considering switching. How hard to you guys think it would be to switch OB’s at 36 weeks pregnant? Would it be worth it to be in a more updated hospital with a higher level neonatal unit? I’m thinking yes.